The PC I was using for my Pacman arcade box has died. It was using an ATI All In Wonder video card with component out. The component out went to the analog TV (RCA). Here's the video card I was using that died: https://www.amazon.com/ATI-All-Wonder-9800-Graphics/dp/B0000AINE1 - It had component out. I basically need to buy a new Micro ATX PC and need to buy a video card that can output to a lcd/led monitor, but also have component out to an old analog TV? Any recommendations on a video card? The new PC will have PCIe slots. Re: Please recommend modern video card with component out to old analog TV? No newish card has component out, AFAIK, so you'll be looking at something older. The TV-out ports have kinda fallen by the wayside, which is fine by me because far superior solutions exist. The easiest thing to do would simply be to get whatever video card you want, and, say, an HDMI-to-Component converter (with 480i output) This will add a little bit of lag, but the picture quality should be similar to what you have now. The best option in terms of both lag and picture quality is going to be crt_emudriver with a 1:1 RGB-to-component converter, but this is probably a bit more expensive, and certainly a bit more work to understand and set up. No newish card has component out, AFAIK, so you'll be looking at something older. Do you think the composite from second picture will work with the cable in the first picture? an HDMI-to-Component converter (with 480i output) This will add a little bit of lag, but the picture quality should be similar to what you have now. For a twitchy game like pacman, it seems that any type of lag would be bad. Is there any type of converter that works with no lag? I'm not sure what this is, I'll have to do some research. I'm assuming crt_emudriver is like mame? Does a 1:1 RGB-to-component converter get detected by the crt-emudriver? Hmm. I'll do some research. I'll definitely check out this guide! This is very helpful. The composite cable might work. Google the pinout for the 8800's TV-out port, and see if it does Y (the green socket) and composite on the same pin. A good RGB-to-component converter introduces no lag. There are a few listed in post #10 of that thread i linked before. It worked. I plugged it into the blue s-video cable and got the 8800 gt to output display to the TV. The only problem is the screen is shaky, you wouldn't happen to know any tricks to fix that? As far as I can see, that cable with the "svideo" end and the red/green/blue RCAs on the other end will carry component video out from your card. Check the "s-video" end on your cable and the video card, if it has 4 pins/holes + slot then it can do component. However, you are probably just getting a composite signal out of there because I'm guessing you haven't installed the software/enabled the options. You'll need to enable component out with your video card's software utilities. Note that even if you get component working from this card, it'll still be a 480i squeezed image. That's the way it is with the analog TV-out cards ("VIVO"). It'll still be better than composite. 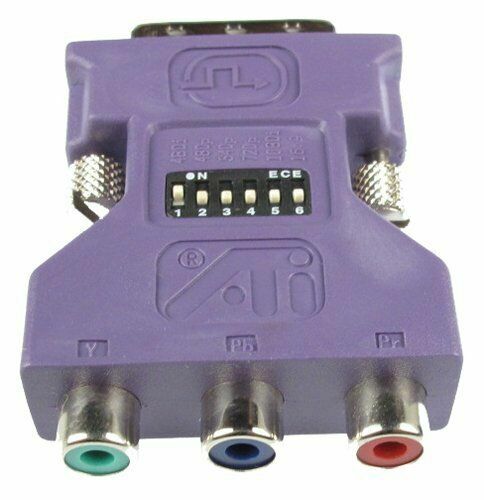 An alternative: buy any CRT-emudriver supported modern-ish Radeon/ATI/AMD video card with VGA or DVI-I out, and buy a RGB-component signal converter like one of those Buttersoft linked to on AussieArcade. It'll cost you an extra $80-90 but the picture quality should be superb, nearly RGB quality. Used them with a 9550 ATI card I believe back in the day. Beautiful solid picture out to my CRT TV with it. They say 480 i/p but wondering if they will go lower. Wow, i wonder what's inside that thing? Got any more info on it? Ah, so you've got the card putting component out on the VGA head then? Any pics? Hopefully that should give you more control over the video modes then. The way I understand it is tThose dongles don't convert the signal themselves, rather they pass the component through with some extra signalling for video mode (eg 480/720/1080 etc) to HDTVs and such. If your card doesn't output component already, they won't help. Those dip-switches are also specific to the card that dongle is designed for, and they usually came with the card itself. I just know I had to match the dip switches to the display size in the software to get it to work. It connects to the DVI connector and from what i've seen worked with all 8XXX and 9XXX model video cards I owned. But, I can't remember if windows 7 worked. Ah OK was wondering if it was DVI or VGA, impossible to tell from the pic. I've seen both kinds. How did you enable component out on the card? Yes... you need a card that supports VIVO TV-out. Back in the Good Old Days. AFAIK nobody makes these nowadays. That dongle does not give you the component, it is just passing it through from the card. The dip switches are for mode selection, mostly to do with HDTVs and projectors (do little for SDTV, unless you are just rescaling to standard modes like 480i). You'll see I mentioned this earlier in the thread. I've certainly done component to SDTV with Radeon 9250 & 9550 cards which support VIVO, there are many others such as the All-In-Wonder, I posted a list of cards on another thread (somewhere on this forum). You would use the ATI Catalyst software to enable component out and then Powerstrip for the 15khz modes. These days I'd try CRT_emudriver instead of Powerstrip. Even with a VIVO card, you'd have to enable 15khz modes separately (or be limited to a 480i scaled output). If I remember correctly it just recognized the TV as a monitor. I booted the PC on the TV then had a hell of a time setting the proper resolution. I think I was able to hook up an lcd as second monitor to configure resolution and over scan for the TV which was set to the primary monitor. It was annoying to set up but once done it looked good without flicker. I just used a standard video card. no tv tuner at all. Your 9550 ATI was one of the cards that adapter was designed to work with using the VIVO stuff. I remember looking into them years ago but the product descriptions made it clear they only worked with specific ATI cards. I keep getting hung up on the use of VIVO. 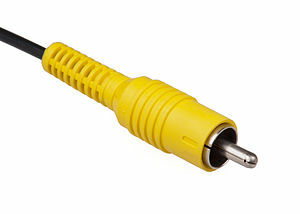 You didn't need a VIVO card to use this adapter. just the proper model range. here is the list I found for all compatible cards. That's not all of them, there are other cards too, basically any card of that era with TV-out is potentially component-compatible (hint, check s-video style round plug they usually have, if there are 4 pinholes then it most likely is component-capable). There were a lot of other cards with TV-out (eg 9200 and X1050), including some Nvidia cards from the period. The problem for retrogaming is that those cards do component out only for certain resolutions/modes, even when you take it out of the VGA/DVI head. You match the mode to the dip-switch positions, typically 480i for SDTV or higher for HDTV/projectors. That means that all you get is a relatively crappy interlaced 640x480i, with all your mame games squeezed into that. What you could do to make it much much better is to run a driver like Powerstrip, or soft15khz or CRT_emudriver on the video card as well, which gives you direct control over the video modes. Unfortunately iirc most/all of the Nvidia cards couldn't go below certain resolutions without line-doubling (double-thick lines) which looks even worse, you lose a lot of detail. So you were pretty-much limited to using the ATI Radeon cards for component retrogaming goodness. Back in the days before Sailorsat came up with Soft15khz I did it with an ATI Radeon Sapphire 9600 card and Powerstrip. It looked great! But then I discovered there were heaps of SCART TVs in Australia and I fell in love with RGB. Even nowadays with CRT_emudriver, it really only works on ATI/AMD cards. The GeForce GTX 280 was the last video card I bought that had component breakouts. That was 2010. When I replaced it 2 years later with a GTX 580 it no longer had component out, just HDMI and DVI. I'm not sure I have any working ati cards left that work with the dongle. I'll be cleaning the basement. Might be in a box somewhere. Also, regarding "modern video cards" which is the OP, starting with the GTX 10xx series in 2016, Nvidia cards no longer have a RAMDAC or DVI-I ports (the kind you can use those DVI-VGA adapters with) and are strictly digital only now. I don't know how it is on AMD cards, but it's fairly safe to say any kind of analog output is dead or on its deathbed. Hold on to anything you have that can still do analog. I have too many old ATI 9250 and 9550-ish cards from that period, and even some Nividia MX440s. I have a few older ArcadeVGAs too. Trouble is, mostly they are AGP cards and everything these days is PCI-e. I even have some extremely old S3 video cards that run on PCI, but it would be less-than-fun to try and find compatible drivers. I should go buy some sh!t, old PCs somewhere and hoard them. Curious. What make/model TV are you outputting to? With that card, any standard component SDTV would be good for arcade (HDTV can work but there are more issues). The Radeon series 9550+ can do component out, and some came in PCI-e format as well as AGP iirc. Not made anymore, but you might find one on 2nd hand market. I’m wondering if the CRT can be RGB modded. If so, there are a ton of Small form factor PCI-E cards that’ll work with crt_emudriver to output a 15khz RGB signal. There is that, plenty of old cards can. What some people might not realise is that there are also a heap of good TVs out there that can't be RGB modded. These will likely either take component or can be component modded, and an old ATI Radeon 9XXX series card would work really well with that. The old advanced mame bootable CD would probably work for an S3 card. Ubuntu Linux has some good open source drivers for older video cards and there are kernel patches to allow you to hit the non-standard 15khz resolutions. Then it comes down to what version of mame can run on a processor that works in an AGP motherboard. Pretty sure we are talking first gen P4 and older. I've got all kinds of old hardware in my basement. Think I've got an amd k6-3 somewhere and a K7. I do like throwing minimal linux on these and compiling an old version of mame just for kicks. Attract mode will run on P3 with an MX4000 card. Interesting ideas there. My Linux experience is very limited, but anything's possible (Basically, I just keep a Xubuntu USB stick for booting my Windows PCs/laptop when they are being difficult). Maybe the Linux open source drivers get around the line-doubling at low-res issue with those MX4400 cards. I thought it was "hard-wired" into them, but maybe that's wrong, maybe it is just with the proprietary drivers. Those cards are supported by advmame. So I guess any low res issues are addressed with open source drivers. Don't know, don't think I have any of those cards so can't test.